Is your water heater leaking and you don’t know what to do? Not to worry, you found the right water restoration company. If this is an emergency situation, locate the shut off valve and turn the water off to the water heater. Most homeowners rarely think about the life span of their appliances, plumbing, heating, ventilation, and air conditioning system, and a variety of other things. Water heaters have an average life span of about 10-12 years. Performing proper maintenance will help the longevity of a water heater. There is also quite a few different reasons why a water heater may be leaking in the first place. One thing to keep in mind is that no matter the size of the water heater, a small leak could potentially turn into thousands of dollars of water damage. A water heater leaking can cause serious damage. The water could seep into the walls, floors, and sub-floor. Not to mention, the connecting walls and rooms could begin to become affected as well. It’s easier to handle a small water heater leak. Once your water heater is overflowing and flooding your entire home, there is no going back. Say goodbye to all the years of remodeling and say hello to a water drenched home. Now, I am not trying to scare you but the maintenance on a water heater should not be ignored. Did you know that mold could start growing within 24 to 48 hours? Mold can spread rapidly in the right conditions and it’s important to know how to avoid mold growth. Experiencing a water loss can be a daunting experience, therefore preventative measures should be taken. A small water heater leak can become worse overtime. It’s important to jump on the issue before it’s too late. 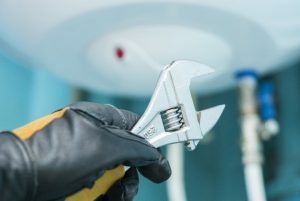 A water heater leak could be coming from a few different places but generally, the leak could be coming from the top or the bottom of the water heater. It is possible that the water heater tank is releasing condensation. If you feel comfortable wiping up the water and waiting a day or so to see if it has returned, that would probably be the best way to determine if there is a true leak. If you are confident that your water heater is leaking, it is best to immediately turn off the power source to the water heater. Safety first! It is important to determine whether your water heater is electric or gas because the power source is not located in the same area. Electric Water Heater: Locate the circuit breaker box. It is typically located near the water heater on the wall. There should be a labe l that indicates which switch is for the water heater. 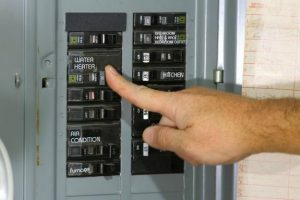 Shut off the breaker switch for your water heater. If there isn’t a label for the water heater, shut off the main breaker instead. 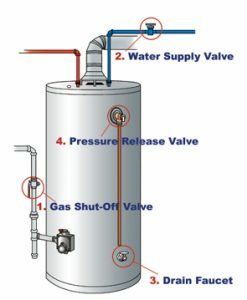 Gas Water Heater: Locate the gas supply valve to the water heater. 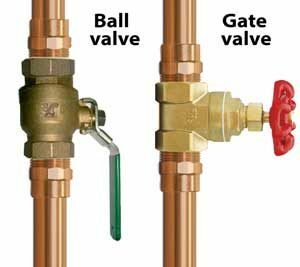 Generally, the gas shut off valve is located on a singular pipe coming out of the closest wall. Keep in mind that the shut off valve will always be located near the wall. Turn the valve clockwise until it is perpendicular to the gas pipe. Next, you need to locate the water supply valve to turn the water off to the water heater. If the water heater leaking is spewing large amounts of water and it isn’t safe, turn off the main shut-off valve for the house instead. This will shut off all water to the house. 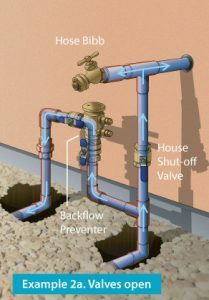 Main Shut-off Valve: The main water shut-off valve will be located on the outside wall on the side of the house. The valve will be located on a pipe running down from a water spigot. Turn the valve clockwise until it stops. Gate Valve: This valve will look like a round wheel or knob. Turn the knob clockwise until it stops. Ball Valve: This valve will look like a lever or handle. Turn the lever clockwise until it is perpendicular to the pipe. 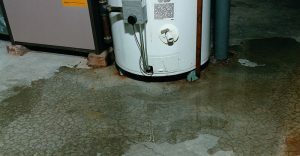 Is your water heater leaking from the bottom? One reason could be the drain valve. The drain valve (located at the bottom of the water heater) is used to drain the water from the tank to remove sediment and perform maintenance. Sometimes, the valve becomes corroded and old or has a loose connection. If the valve is loose, a good tightening will surely fix the issue. If the problem persists even after the valve has been tightened, it could mean that the valve needs to be replaced. A water heater leaking from the drain valve could also be caused by debris inside of the tank. Flushing the debris from the tank may help the issue. If none of the above, it may be time to replace the water heater before the situation becomes costly. If your water heater leaking starts from the top, it most likely is because the water inlet or outlet valve is leaking water. 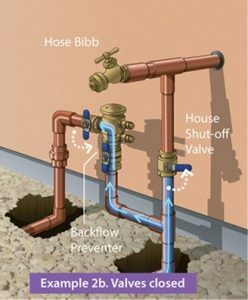 If the pipe is leaking water around the connection points, it could mean that the fittings are loose and need to be tightened. Sometimes the pipes and valves become loose over time and corrosion may take place. If the water heater leaking is spewing a large amount of water, it’s probably best to hire a qualified professional before trying to fix the problem yourself. 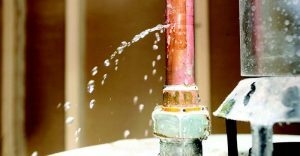 Often times, the actual cause of the leak stems from a more serious issue. Water heaters have a temperature and pressure relief valve to control the pressure inside. The valve is located towards the top of the water heater and has an overflow pipe attached to it which runs down the water heater. When the pressure relief valve stops working, the water will expand from being heated which causes extreme pressure in the tank. This is very dangerous and a more serious issue than a leak because the water heater could potentially explode. Hiring a professional would be the best option in this situation. You have a couple different options if your water heater is leaking. You could either locate the leak and attempt fixing the problem yourself, or you could hire a professional to fix the issue; but i’m sure you knew that! 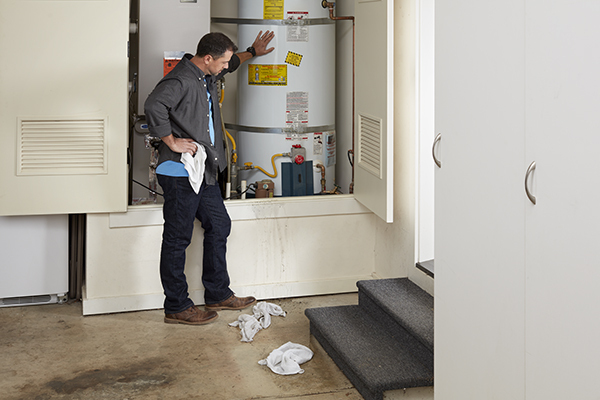 What happens if your water heater leaking causes a flood into other areas of your home? You now know how to turn off the water and power to your water heater, so that’s a good start. If you are unsure how to handle the next steps, call a certified water remediation specialist to come to your property and assess the damage. A certified water removal specialist will be able to remove the unwanted water and the affected materials to prevent mold growth. Call your insurance company to find out if your policy covers water damage. If they do approve the water damage, the water restoration company will remove all affected materials and dry all surfaces containing moisture. After the home is completely dry, the reconstruction will need to take place. The insurance company will typically write an estimate which will provide the breakdown of everything that needs to be replaced. Read up on the upcoming blog which will cover the in depth version of the general water restoration and reconstruction process.